Where Are USB Ports Located? 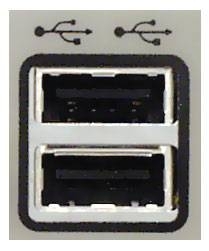 Typically, Universal Serial Bus (USB) ports are located on the front or back of the computer. These ports are designed to function with a number of different devices, and for this reason, they need to be easily accessible to the user of the computer. There are usually multiple USB ports located on the back of the tower, typically near the ethernet port. These are used for plugging in printers, scanners or other devices that will remain connected to the machine. On most newer machines, there are USB ports located on the front of the tower. These are used primarily for attaching USB drives (sometimes called travel drives, jump drives or thumb drives) or other devices that will be plugged in and unplugged often. There is generally at least one USB port located on the motherboard inside the computer case. This port is used for attaching a device inside the case that will remain connected, such as an additional hard drive or a wireless Internet card. On most Macintosh computers, as well as some newer PC computers, there are USB ports located on the sides or back of the keyboard. On Macs, one of these ports is used to connect the mouse, but there is usually at least one more for use. A USB port is small, usually no wider than the standard ethernet port, and about half as thick. They are generally grouped together in rows on the back of the computer, and there are normally only one or two on the front. USB ports have a small amount of power running into them, so do not plug in a USB device if there is any moisture. Also, be careful when plugging in two powered units with a USB, as there is a small risk of shock. What Is a Laptop Wireless Card? What Is a Wi-Fi Catcher?